Some techniques in agricultural extension are like “waiter music,” explains Eric Boa. This is when waiters put on their favorite music, regardless of whether the diners like it or not. Extensionists do something similar when they promote techniques that are impractical or farmers don’t need them. For me, the classic example of waiter music is bokashi, an organic fertilizer invented in Japan in the late 1800s. Bokashi is made of many ingredients, including rice husks and animal manure. In Latin America, extensionists have been promoting bokashi since the early 1990s, if not before. The extensionists eagerly gather the ingredients, including some like molasses that have to be store-bought, and mix them together into 100 kilos or so of dough. Farmers are told that if they stir the bokashi every few days the mixture will be composted within three weeks. Like any organic fertilizer, bokashi is bulky, and 100 kilos of it is only enough for a very small garden. As far as I know, no farmers in Latin America have ever adopted bokashi on their own, I suspect because it is a lot of work to make, and because some of the ingredients are store-bought. Despite these major drawbacks, extensionists continue to promote bokashi. So this week, when in Nepal, I was delighted to meet Amrit Narayan Shristha, who told me that he owned a bokashi factory. We met in Hemja, a small town in the hills, where Mr. Shristha was visiting agro-dealers to sell them neat, 5 kg bags of bokashi. As luck would have it, my travels would later take me to the distant town across the country, where Mr. Shristha has a factory producing bokashi. Even after 15 years of running his factory, Mr. Shristrha was breathless with excitement about the fertilizer. He gave us a pamphlet which expounded on the virtues of bokashi for soil health and clearly listed its chemical components, including the relatively low amounts of nitrogen, potassium and phosphorous compared to inorganic fertilizers. However, like any organic fertilizer, bokashi has all of the types of nutrients a plant needs, including the minor ones like zinc and boron. With my Nepali colleague, Abhishek Sharma, we were warmly received. I was hoping to see machinery turning out large volumes of bokashi, because, if it could be made in large enough amounts, and cheap enough, it might be a viable option for smallholders. A large mechanical grinder is used to reduce the rice hulls to dust, and another grinder for the other ingredients. The rice hulls go into a large machine that mixes them with chicken manure, cow dung, wood ash, mustard oil cake, sawdust and “effective microorganisms” These may be one of the most important ingredients, because they are beneficial bacteria and yeasts. 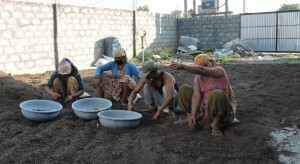 Later we talked to an extensionist and a group of farmers, who were using bokashi to improve their soil. They add a bit less than a ton of bokashi to a hectare of rice, along with chemical fertilizer, and they are pleased with the increases in yield that they get from the combination. We were surprised to see four workers on hands and knees on the factory floor, picking sticks and debris out of risks husks from a rice mill. There is still a lot of manual work even in a mechanized factory. Workers stir the bokashi on the shop floor, every few days, using a hoe. Labor and space limitations keep the factory from making more than 20 or 40 tons a month. However, as Paul and I saw during our study of African Seed Enterprises, if a company can stay in business for several years, this alone is a good sign of success. 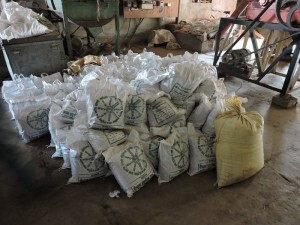 The factory receives a government subsidy, but it is producing a product that farmers are using, if not as a bulk fertilizer, then as an amendment to improve their soil with organic matter, micro-nutrients, and beneficial microorganisms. Farmers may not want to make their own bokashi, or need to. If someone else makes it for them, at an affordable price, farmers will use the stuff. As with many agricultural innovations, the trick is not to get farmers to make all of their own inputs, but to encourage entrepreneurs to make products that they want. Manufacturing a product that farmers will buy and use is like a waiter who plays the music his customers enjoy.